So much yarn, so little time. : WOOHOO meerkat world tour is famous! Click picture to enlarge to readable proportions! That video is the loveliest thing I have seen in ages!! Yay and woohoohoo! Well done Nifty - MeerKats to conquer the world! Oh Nifty, What a treat! Lovely video. So enjoyable. Fabulous Nifty - I hope that the exposure reaps wonderful rewards. Bill the Badger is wishing them bon voyage! yay nifty! well done. can't wait until my little meerkat visitor arrives! Well done!! That's fantastic publicity for you - your meerkats are soooo cute too! Looks like YOU are famous, too. Congrats!! It's well-deserved! OMG!! This is incredible! I know you must be thrilled beyond belief! YAY! The video is fabulous! I can hardly wait for the little guy to visit me! LOVE the Meerkats!! How wonderful for you, that video is priceless! What a fantastic interview. Great to watch. Great job! Wow, this is fantastic. 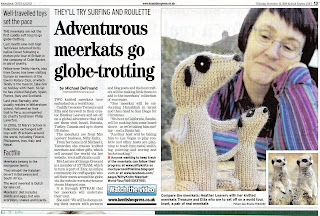 Well done Heather - and meerkats. Love the video! Awesome article! Sounds so exciting!